A video shows ICE agents waiting in a Denver courthouse hallway. Here's why that's controversial. - Denverite, the Denver site! A video shows ICE agents waiting in a Denver courthouse hallway. Here’s why that’s controversial. This video is evidence of something immigration attorneys insisted was happening and that local officials had said was not happening. Feb. 23, 2017, 5:35 p.m. 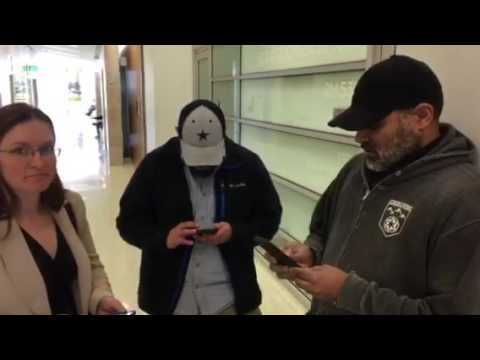 In this video, attorney Whitney Leeds confronts three men standing in the hallway outside Courtroom 5C in the Lindsey-Flanigan Courthouse. She asks them if they are agents of Immigration and Customs Enforcement, if they are there to arrest someone, if they have a warrant, if the court administration or the judges are aware that they’re there. They confirm that they work for ICE and that they’re there to make an arrest. They seem to confirm that they don’t have a warrant, but they won’t provide any additional information. This video, shot on Feb. 16 by an intern with the Meyer Law Office, is evidence of something immigration attorneys insisted was happening and that local officials had said was not happening: immigration enforcement officers using the court process to find people wanted for possible immigration violations and take them into custody. With President Donald Trump’s Department of Homeland Security announcing new enforcement priorities that extend to immigrants who have been arrested but not necessarily convicted, there is widespread fear and confusion in the immigrant community about when and how to interact with civil authorities and law enforcement. At the same time, Denver is under renewed pressure to cooperate more with ICE after reports of two men wanted on immigration issues being released from the Denver jail and now standing charged in separate homicides. Attorney Hans Meyer said he wants the city to look at what it can do to keep immigration enforcement out of the court process, whether that’s the hallways of the courthouse or meetings with probation officers. This question of whether ICE agents wait in public places associated with the criminal justice system came up earlier this month at an Immigrant and Refugee Forum hosted by Mayor Michael Hancock. In response to questions, Sheriff Patrick Firman seemed to acknowledge that it can and does happen, while City Attorney Kristin Bronson said judges do not believe that it is happening. Bronson said she had been talking all week with the presiding judge of the county court, and he was not aware of ICE agents being in court. “We have not been able to confirm that is happening in Denver right now. I suspect there might be some instances of that, but the presiding judge is not aware of this,” she said. Jon Sarché, a spokesman for the state courts, said he’d never heard of this happening. Julie Gonzalez, policy director at the Meyer Law Office, said she provided a copy of the video to the City Attorney’s Office on Wednesday. An agency spokesman said the video is an effort to “demonize” ICE agents. Agents don’t have a standard uniform, though they wear tactical gear on some operations, and they are allowed to wear street clothes to work, ICE spokesman Shawn Neudauer said in an email. You might be wondering why you should care or if this is even a bad thing. If you’re someone who would like to see more immigration enforcement, you might be wondering what’s wrong with ICE agents standing in a courthouse hallway. Denver, like nearly all Colorado sheriffs, has a policy of not honoring immigration detainers. That means that if ICE flags someone in the county jail for immigration issues and asks the jail to hold on to that person beyond the time they would normally be released, the jail won’t do it. So why shouldn’t ICE agents show up in other public places where they know they’ll be able to find the people they’re looking for? Meyer said it’s the same reason that local police and sheriff’s deputies shouldn’t be responsible for enforcing immigration law. Witnesses and victims might not want to report crimes, and that means criminals — whether immigrants or citizens — are less likely to be caught and successfully prosecuted, Meyer said. A lot of people who felt differently testified Wednesday in the legislature in favor of a bill that would hold officials in cities like Denver accountable for crimes committed by undocumented immigrants. It died in committee, but the question isn’t going away in this political environment. 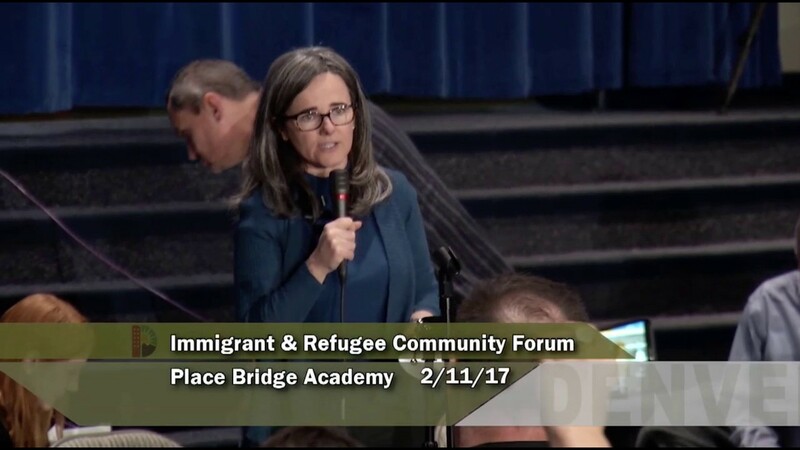 “The important thing is not to be alarmist to the community but to provide a tactile example of how ICE is trying to manipulate local governments into advancing Donald Trump’s deportation machine,” Meyer continued. It’s not clear what the city could do to stop ICE agents from being in court — any member of the public can go to court — but the city is in the process of reviewing all its rules, laws and procedures that interact with immigration law to see if there any changes that should be made. Meyer said it has been much more common for ICE to show up to probation appointments than to be in the courthouse, and the city should have a bright line preventing communication between probation and ICE. At the time of the community forum, the city was under pressure from immigrants and their advocates to be more outspoken, to do more to protect this community from aggressive enforcement. That pressure has not abated, but there is now intense pressure from the opposite side not just locally but nationally. Fox News host Bill O’Reilly said Hancock has “blood on his hands” for supporting the policy that allowed Ever Valles to bond out of jail on an auto theft charge in December. Valles is now one of two men charged in the murder of 32-year-old Tim Cruz at an RTD light rail station earlier this month. Meyer said the changes he’d like to see would not prevent ICE from doing its job. There’s nothing stopping ICE agents from getting signed arrest warrants and picking people up at work or home like other law enforcement entities have to do. Meyer also wants immigrants accused of crimes not to panic and to know their rights. They should continue to show up for court dates or meetings with their probation officers — not showing up can just create more problems down the line — but to have a plan for what to do if they encounter ICE agents and to know their rights. Don’t lie, but know that you don’t have to say anything. All you have to provide is your real name and date of birth. Meyer said people should especially not answer questions about their place of birth or immigration status, as those can create probable cause for an arrest. Ask if agents have a warrant. Ask if you’re being detained and whether you’re free to go. Have copies of all immigration documents and case numbers in one place, as well as medical information and emergency contacts. If you have children, figure out who is willing to take care of them if you’re detained and put something in writing. Don’t sign anything. Don’t give up your passport. Consult an attorney who is familiar with immigration law to understand how a criminal case can affect your immigration status. There are “Know Your Rights” pamphlets available online, and Meyer has made his own. What happened after this video was taken? According to Leeds, one of the ICE agents stepped away to make a phone call, and shortly afterward, several sheriff’s deputies approached Leeds about filming in the courthouse. She asserted that she has a right to film in the hallway, and after some back and forth, they agreed that she did. The ICE agents left without making an arrest. This story has been updated to include a response from ICE. Did you like this story? There’s more where this came from. Subscribe to our newsletter here.